I have been getting a lot of requests recently for sauces. They aren’t so much as requests, but more like pleas for help. Help me! Flavor balance, thickening, getting it right… how do I do it? My answer, in my humble opinion, is that it’s complicated. Unfortunately there is no formula for sauces. Each sauce is specific, unique, and requires its own discipline. Sauces are difficult, complicated, and require a tremendous amount of skill and experience. Please remember, sauces are technique driven! They take practice and patience. In the beginning, it’s easier to make reductions than making truly composed sauces. For example, reduce 1/2 gallon of orange juice to a syrup, add honey, rosemary, swirl in a couple of pieces of butter you have a very simple orange/rosemary sauce, perfect for fish or light chicken sautes. So, to simplify things, the best route for making a sauce is to have a plan. A battle plan. Determine what your end result should be, and make a plan to get there. And keep it simple. A simple reduction. Simple ingredients. A few basic flavors that classically work. 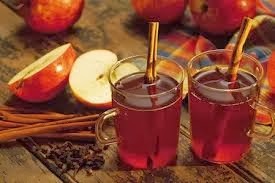 Being that it’s fall now, I am going to go through a simple apple cider sauce, that seems to work with a lot of dishes. It’s only a couple of reductions, easy ingredients, and hard to get wrong. This sauce really works best with roast chicken or roast pork, but will also fit with beef or other red meats. In a medium sized non-reactive sauce pot, begin reducing the cider with the cinnamon sticks. Reduce until almost thick enough to coat the back of a spoon. Remove the cinnamon sticks and add the vinegar. Return to a boil and add the chicken stock. Again, reduce until slightly thick. Add the heavy cream and reduce until just thick enough to coat the back of a spoon. Remove from the heat and swirl in the butter. This finishes the sauce and gives it a little more richness. The sauce is now ready. Best served with roast pork or chicken. This entry was tagged Apple, Cider, Fall, New England, Sauce. Bookmark the permalink.